Have you seen this punch bowl? It's a prize piece of Ford history, lost since 1951. The Fords want it back. The moving assembly line, the $5 workday, a steadfast belief in mobility for the masses. These were the foundation of Henry Ford's epoch-making success as an automaker. But not the whole story. Ford Motor Co.'s true cornerstone — little-remembered and perhaps lost to history — is made of cut glass. 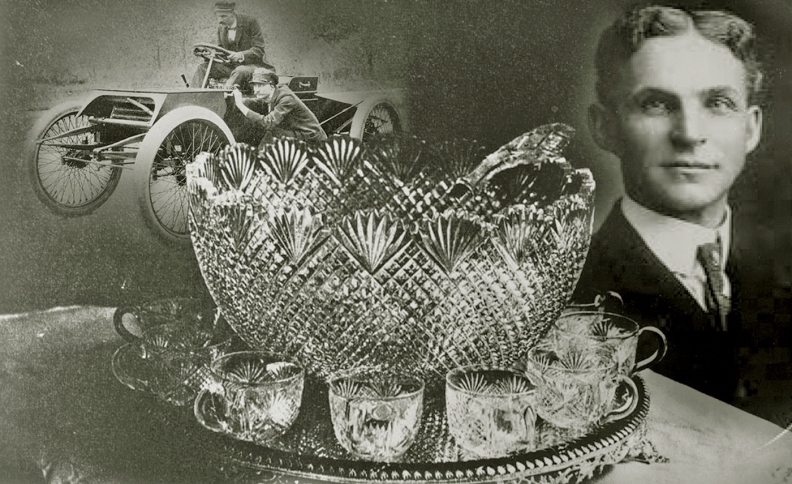 Years before the first Model T rolled out of Ford's Piquette Avenue plant in Detroit, the formation of the nation's second-largest automaker hinged on a turn-of-the-century punch bowl etched in a classic strawberry, diamond and fan pattern. It's been missing since 1951. 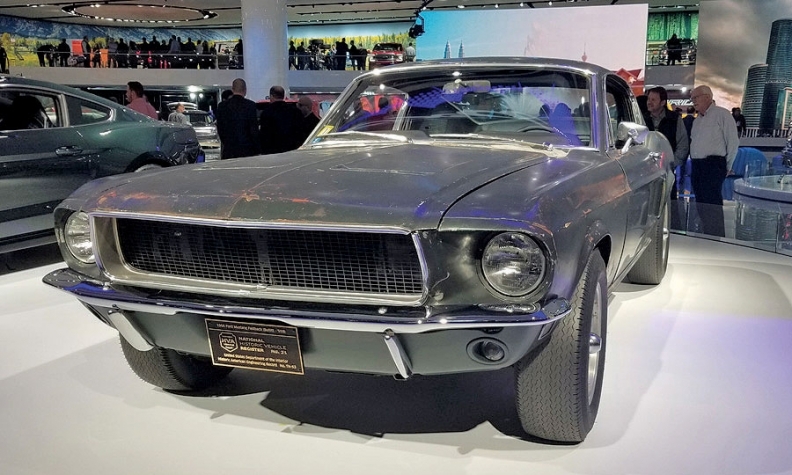 Buoyed by the good fortune of suddenly finding Steve McQueen's 1968 Mustang Bullitt, on display at the Detroit auto show, the Ford family would like America to check its attics and basements one more time. Steve McQueen's 1968 Mustang Bullitt, once thought to have been lost, on display in Detroit. "It really is a very important piece of the family's history," Edsel Ford II, who's holding on to the slim hope someone can still find it, told Automotive News last week. A young — and poor — Henry Ford won the punch bowl after besting heavy favorite Alexander Winton, founder of Winton Motor Carriage Co., in a 10-lap race on Oct. 10, 1901, at the Detroit Driving Club in Grosse Pointe, Mich.
"Many of us believe if Henry Ford hadn't won that race, he might not have been able to raise the money to finally build Ford Motor Co.," said Edsel Ford II, great-grandson of Henry Ford. "In a way, the trophy means a great deal." The bowl was never supposed to belong to Ford. Race organizers presumed Winton would win, so they let his promotions manager select the bowl as Winton's would-be trophy because, it was believed, it would look good in the bay window of his Cleveland home. "Henry Ford was a nobody, virtually unknown even in Detroit, and Winton was the best-known racing driver in the U.S.," said Matt Anderson, curator of transportation at The Henry Ford, the museum complex in Dearborn, Mich. "It's a classic David vs. Goliath story." Ford fell behind early in the two-man race, but on Lap 7, Winton's Bullet racer began to smoke and malfunction, while Ford's Sweepstakes car passed it, shocking the crowd of 8,000. After Ford opened his Fair Lane estate in 1915 in Dearborn, the unmarked bowl was accorded a place of honor at a table in the entrance hall. It stayed with the family until the death of Henry's wife, Clara, in 1950. The couple's children, not realizing its significance, placed it up for auction through Parke-Bernet Galleries in New York. It reportedly sold for $70 as part of Lot No. 20 in 1951. Staff at The Henry Ford discovered the owner's name: the Garden Shop in New York. But the store has long since closed. 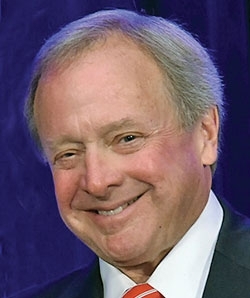 "I'm afraid it may be gone forever," Edsel Ford II said. Only one photo of the punch bowl is known to exist: It was found among a string of negatives taken by Henry Ford himself. Some have offered a reward. In 2003, California Ford dealer Jim Burke offered an Expedition SUV, valued between $35,000 and $40,000, to anyone who could find the bowl. No one came forward, and Burke died in 2006. "Despite our best efforts the Punch Bowl was never found," wrote George Hay, the dealership's director of marketing and advertising, in an email last week. "Jim Burke Ford-Lincoln is committed to help retrieve and return the bowl. We are currently considering the renewal of Jim's generous offer. We are confident the promise of a free 2018 Ford Expedition will captivate the imagination of the country and lead to the return of the Punch Bowl." Anderson said anyone coming forward with what is believed to be the bowl would need to match it to Ford's photograph and would likely need some paperwork from the auction or some detail of ownership to authenticate it. "People ask us about if there are any holy grail artifacts we'd like to get," Anderson said. "That's always the first one we talk about. It's one object that would immediately find a place on the museum floor."